For four days in early December The Kings Ginger Liqueur will open a special warm cocktails bar in the courtyard of the Hoxton Hotel on Great Eastern Street. Whether you're shopping in the area, or just passing through, pop-in to warm yourself up! 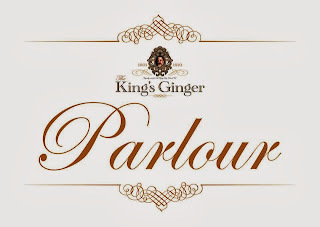 "The King’s Ginger Liqueur and east London’s Hoxton Hotel are thrilled to announce an exciting new collaboration: The King’s Ginger Parlour. The Edwardian Christmas pop-up bar will open on Thursday 5th December 2013, for four days only, in the atmospheric courtyard garden of The Hoxton Hotel. Five seasonal King’s Ginger cocktails have been specially created by drinks expert Dan Warner, to kick start this years festive celebrations. The King’s Ginger mulled cyder, served hot or cold, will be sure to tickle one’s taste buds and warm revellers from the inside-out. Other creations on the menu include ‘Gingers Back In Fashion’ which is definitely one for high spirted ladies and sporting gentleman alike. This unique ginger liqueur was specifically formulated by Berry Bros. & Rudd in 1903 for King Edward VII. Rich and zesty, The King’s Ginger was created to stimulate and inspirit His Majesty in the cold winter months, and has been appreciated by bon viveurs and royalty since its creation."